Every domain has a life cycle starting with its initial registration and ending with it being returned to the public for new registration. This life cycle can be extended indefinitely by regularly renewing the domain, and understanding the life cycle of your domain will help you know when a domain can be renewed and what is affected when the domain expires. Please see below for information regarding each phase of the life cycle of a domain. ICANN (Internet Corporation for Assigned Names and Numbers) regulates domain registrations and sets prices. Visit www.internic.net to learn your rights as a consumer. The registrar can be a company other than the hosting company. While HostGator can host any domain name (as long as the DNS is pointed to us), we cannot register every domain. If you register a domain directly with HostGator, you should always contact HostGator for domain-related help. If you register your own domains as an eNom reseller, then most issues will be handled directly by eNom. You may still contact HostGator first to be sure. To register a domain now, visit hostgator.com/domains. When registering a new domain, be sure to provide a valid email address for your WHOIS as you will be required to verify your WHOIS information via email. If verification is not received within 15 days, the domain name will be suspended. It is recommended that you use an email address independent of the domain you are registering since you will need access to this email address to verify your WHOIS information. If the type of domain you want cannot be purchased online, or if you need to pay with a method other than credit card or PayPal, please contact our Billing department via phone or Live Chat for assistance. Note: Per rules set by ICANN, the maximum registration period for any domain is ten years. You may request renewal or registration up to this limit by contacting us via phone or Live Chat. Example: You initially registered the domain 6thpresident.com for one year. Six months later you decide to renew this registration for the maximum time possible. You may add up to nine years to the term, since this is less than the ten year maximum. Once a domain is successfully registered it is then Active for the term of the registration. Depending on the registrar you use, you may be able to register the domain for up to 10 years. If you fail to renew your domain, your registration will be interrupted, at which point your nameservers will be changed by the registrar. This means it may take a few days before you can see your site is down, and after you finally pay to renew, it may be a few more days before you can see your site is back up. We will send domain expiration notices prior to the expiration date by email to the Registrant Email address listed on the domain Whois. The first notice will be sent thirty (30) days before expiration and a second notice will be sent seven (7) days before expiration. A final email will be sent immediately after the domain has expired. Note: Expired domains registered with LaunchPad will appear for sale on backorder at SnapNames. The rules of redemption are different for every registrar, please see below for how your domain will be handled based on how it was registered with HostGator. Domains registered with LaunchPad will either be placed into a Redemption Grace Period or sent to auction at SnapNames.com on the 36th day past expiration. Once past the 35 day grace period, HostGator cannot guarantee the domain's redemption. 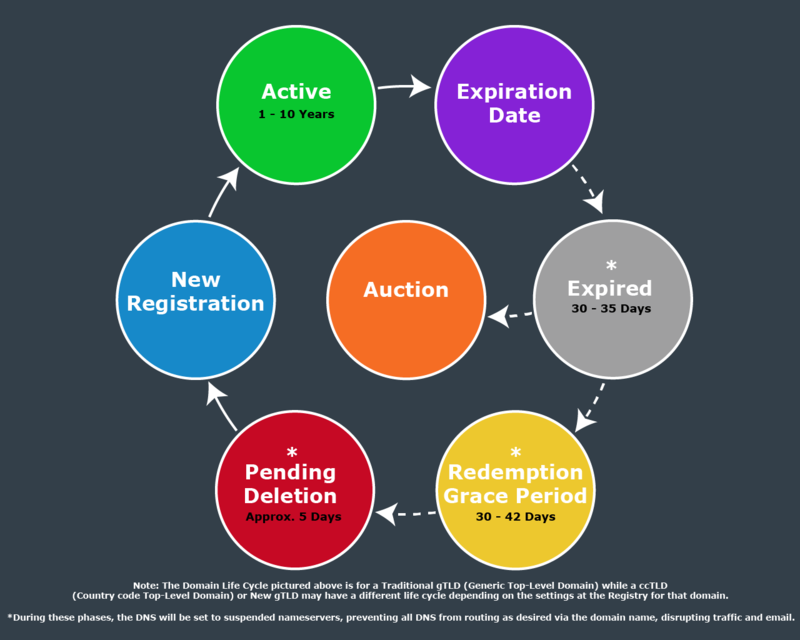 If an expired domain did not receive any bids at SnapNames while within the Renewal Grace Period, the domain will then enter a Redemption Grace Period. While in redemption, the current owner can renew the domain for the normal renewal fee plus a $75.00 redemption fee. After at least 30 days in redemption, the domain will be deleted where it will be released back to the public. Domain deletion lasts approximately 5 days and during this time the domain cannot be recovered nor modified. If any bids were placed during the first 35 days of expiration and the domain was not renewed by the owner, the domain will not enter Redemption and is instead sent to SnapNames.com to be sold at auction. Once queued for auction, the domain will either be sold or deleted no later than 43 days after entering redemption, depending on whether or not the domain is successfully sold by SnapNames. HostGator loses all control over a domain sent to auction and if the owner of the domain wishes to purchase the domain back, they may do so by either signing up for an account with SnapNames.com or waiting for the domain to be released to the public once more. IMPORTANT: HostGator has absolutely no ability to stop/override this process or make an exception. If the customer wishes to bid, the customer will need to sign up at SnapNames.com and place a bid for their domain. HostGator is NOT directly associated with SnapNames.com. Once a domain is put up for auction, HostGator loses all control of the domain. After 29 days of being expired (i.e on the 30th day), domains enter the redemption period. Once a domain enters the redemption period there is a $75.00 fee plus the normal price to renew the domain name, as we must pay a fee directly to eNom in order to restore the domain on your behalf. HostGator will require you to pay this cost or register a different domain. Once the Redemption Grace Period ends, the registrar, eNom, may auction the domain to a higher bidder or release the domain so that it can be registered again. eNom will not announce when they do this, and they cannot be forced to do so. Once a domain has entered pending deletion, the only course of action available is to wait for it to be returned to the public for new registration. During this phase of the life cycle of a domain, the domain cannot be recovered or modified. This phase lasts approximately 5 days. You must always initiate the domain transfer with the new company. The process takes approximately 5 to 7 days to complete. It is important to keep in mind that there are several obstacles that can make a valid domain registration transfer fail. If you have been with your current registrar for less than 60 days, then you are not allowed to transfer yet; however, if you just renewed your domain, you may still transfer because this means you were with the current registrar for more than a year. If your domain status is "Locked," you will need to ask your current registrar to unlock your domain. If your WHOIS information is incorrect or private, you must have your valid email listed as the Registrant Contact Email so you can receive the Transfer Authorization Email to authorize the transfer of your domain to the new registrar. If an invalid EPP code ("Auth key") was provided, you must get the EPP code from the current registrar and provide it to the new registrar. If you change any contact information or nameservers with the previous registrar, you must get a new EPP code, because it may have changed. If your domain name is in redemption, you must pay the current company before you may transfer. Please initiate your domain registration transfers at least one month before the domain expires. This will give you ample time to fix any mistakes and re-initiate the transfer in time. Normally, when you transfer your domain registration to a new registrar, you get an additional year added to your expiration date. However, if a domain expires, is renewed and then transferred between registrars within the first 45 days after the expiration date, the domain will not retain the original renewal year once the transfer completes (meaning your expiration date stays the same). This is a registry restriction and applies to all registrars. To transfer a domain registration now, visit www.hostgator.com/domains and click on the Transfer Domains button.